It's been busy times around here, with much finishing of things, starting new things, undoing other things. Lots of starts and stops, for all kinds of reasons. It all feels a little bit hectic, which I guess is kind of standard for this time of year; at least it is for me. I always make an effort to get things done early so I can have Christmastime feel easy and relaxed, but instead I'm always barreling into the season with wild hair, a growing sense of panic, and a fistful of to-do lists. I wanted to put up the tree on Saturday, as we always do, and so we ran all our errands and came home whistling; Doc made eggnog, and I put some festive music on the old hi-fi...the boxes came down from the attic, and when we opened the one containing our [cheap, old, plastic, white] vintage-y tree, we saw that it had at some point during its deadly-hot summer slumber under the eaves, boiled itself into a sort of salted caramel color that could not be hidden or denied. So we put the eggnog in the fridge, shut off the soothing holiday tunes, and went out to buy a tree. Of course it was raining. 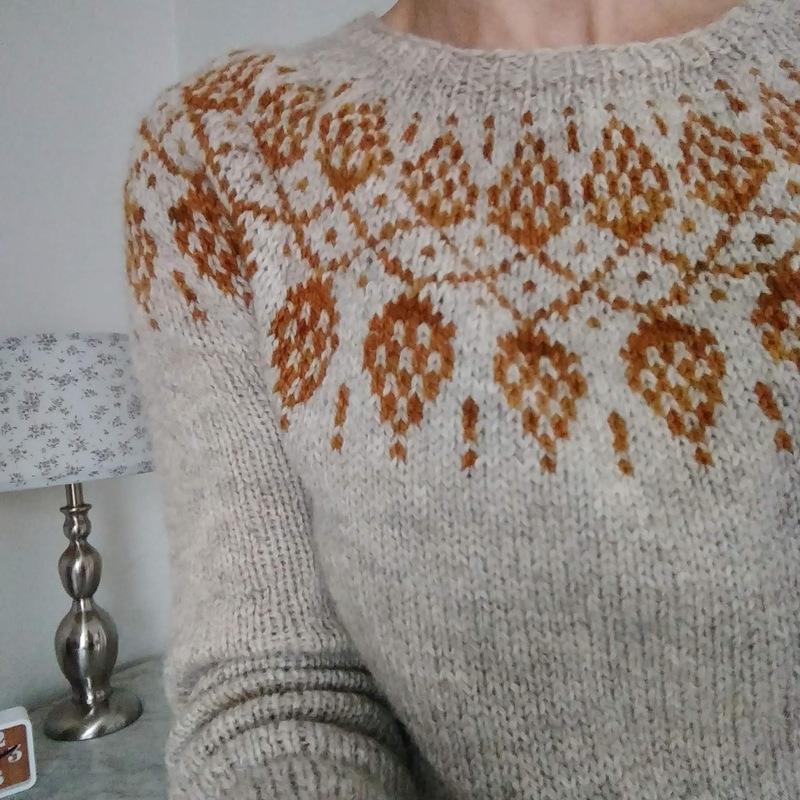 I finished that sweater up there, and I've been wanting to tell you about it. Listen, I could not love that sweater more if it had furry ears and tasted like chocolate. It fits me totally perfectly. It is so soft and so warm, and so dang fancy! I'm proud to say I made it up myself, much inspired by Heidi Kirrmaier's North Sea Nostalgia pullover and Tin Can Knits' Cartography pullover, and also by a most beautiful DIY design by Orlane Sucche. 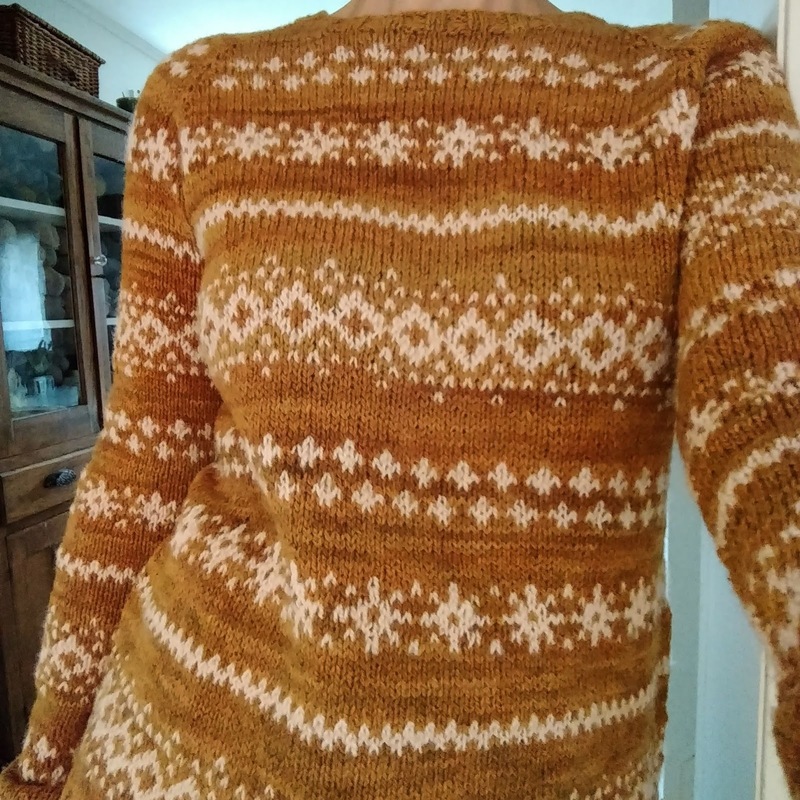 Most of all, though, the inspiration for this sweater came from the yarn itself: Jill Draper's Mohonk in "Ocher" and my own handspun, made from one of Debbie's orphan flock fleeces and dyed by me with madder root, which I used as the contrast color. It is a very soft, warm pink, and it looked so perfect beside Jill's yarn that I knew they were meant for each other. I made it in my usual way, adding four alternating stitch patterns--I think those are mostly from this book. 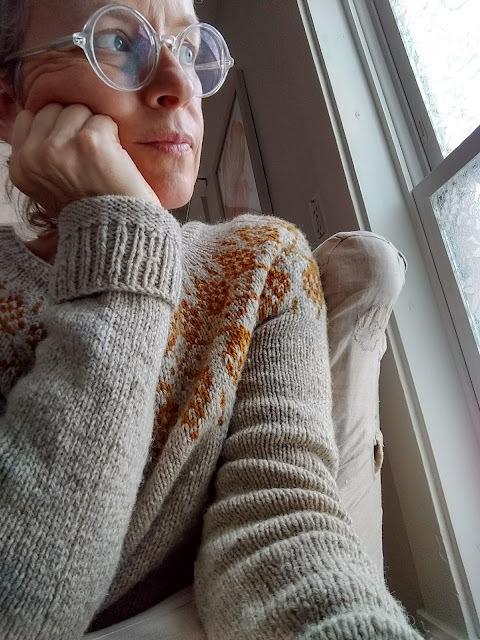 I really, really love this way of doing things, and I was reminded again, and hard, just how much when I had to unravel almost an entire sweater knit from someone else's pattern because I missed an important instruction at the neckline, causing fatal damage to the project. Well, memo for next time: read the pattern. It sounds obvious, but apparently I need reminding. This one flew by so fast, it felt like it hardly touched the needles at all. I used a wonderfully wooly farm yarn from Romney Ridge that I bought last year at Rhinebeck, and it made such a good fabric--sturdy and properly knit. It will last a long time, I think, and will keep the weather out, which is the true work of a good handknit sweater. You'll notice the contrast color is also Mohonk "Ocher"...well, sometimes whatever is in the front of the cupboard is what gets used. These two yarns are pretty different, but they worked beautifully well together. 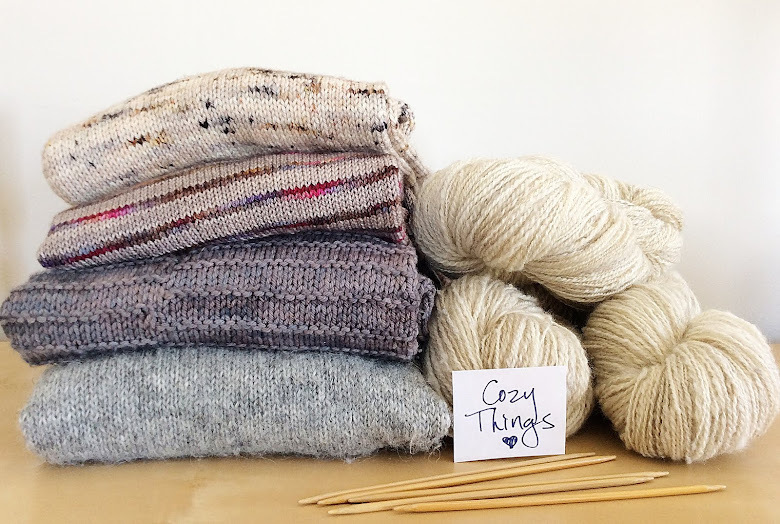 Those hand-dyed yarns from Jill Draper are really great for colorwork. Anyway, I've been wearing this one a lot, too. 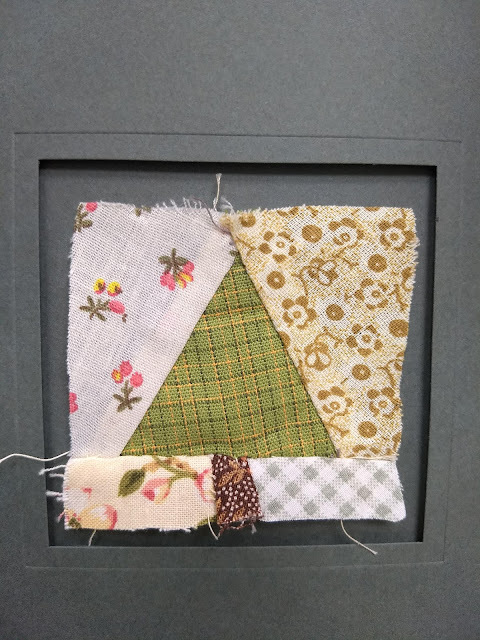 In Learning New Stuff, my friend Deb has been listening to me idly blather on about wanting to learn to do paper piecing long enough. She has tried to explain it, and has tried to demonstrate it visually by using what was on hand at the time, and I am just so thick on this subject that I couldn't figure it out. She showed me her quilt project in progress, all done in paper piecing, and it was so gorgeous my eyeballs bugged out of my head. I whined some more about wanting to learn to do it, so she brought me this little kit and sent me away with firm instructions to find a youtube tutorial and make this little Christmas tree square. I don't even want to tell you how long it took me to make this. It was hours. I picked it apart countless times. This thing is two inches square. I watched ten different tutorials and tried so hard to follow the directions, but I just couldn't get my head around it. The pieces were numbered and everything...okay. Here's what I don't understand, and maybe somebody out there can help me with this. The tree up there: the green tree and the two triangles beside it are pieces 1, 2 and 3. Got it, no problem. Now. The three pieces at the bottom are 4, 5, and 6. If I were piecing this the usual way, I would obviously sew those three together as a set and then add the whole thing to the bottom of the first set, done, easy. But how is that done in paper piecing? I could not figure it out. Help. I finally just did it the usual, non paper-piece-y way and threw up my hands in despair, but I still really want to know how. If you know, please tell me? There's a Lone Star quilt just waiting to be born, and I'd like to do it that way. Time for some egg nog. See you later! Too bad about your tree. Love the sweaters. It feels so good to get the decorations up, I love it. I have no idea with the paper piercing. It looks kind of like quilting. Happy Holidays! Love both sweaters, especially the second one in two colors! OH!!! And that little tree! How that makes my heart leap! Such a shame about the tree, we are getting ours out later today. Love the sweaters, particularly the first one a real feast for the eyes, stunning. Both your sweaters are so beautiful and you will enjoy wearing them on cold winter days. I have no idea about the paper piecing but what you did looks good to me. I love the Mohonk sweater - I live at the foot of the Gunks where Mohonk resides (up above) - yes, we have Jill Draper here! Paper piecing baffles many - I have found that the BEST paper piecers are dyslexic....seriously. Anyway, you are right. The tree would be done first and you would have cut the bottom section off. Then, you would complete the botton section and attached it to your tree. So, the pattern would have been presented in two parts - A being pieces a-c and B being d-f. waa-laa! You got this. I also don't have any advice on the paper piecing, I can barely bring myself to do regular quilts. I have a bag of fabric in the closet from over a decade ago that I had good intentions for. I pull it out maybe once a year and work a few squares together and then back it goes, poor thing. I just don't have the patience for it haha! Your sweaters are just beautiful! I am so in awe of your knitting talent! From the experience I have had with paper piecing, the tree block would have been comprised of two sections - the three pieces of the tree being one section and the three pieces of the base being the other section. Then the two sections would be sewn together. For me the most confusing part is to make sure I start with my first fabric facing the correct way. Love seeing all your projects. As for paper-piecing, I've got nothing but I can say this about your tree, if, you in fact, got a new white one: do NOT store it in the cardboard box! I know! I have a small white tree for my Gram's and Great Grandma's antique glass ornaments that has, as you said, turned a middy color. The interwebs tell me it is some sort of odd reaction between the tree and the cardboard, so when I find one to replace mine, it will be stored in a plastic container. ps: if you have a dishwasher, I'm given to understand sometimes a pass through with the branches will take most, if not all of the yucky color out. My dishwasher is husband-powered, so I haven't tried that tip myself. Agreeing with the others that I would have expected the tree block to be two separate foundations--one for the tree half and one for the trunk half. Your sweaters are beautiful! I wish I could knit as quickly as you seem to. This does seem to be the consensus. I think I’ll keep doing it that way, because why not, if it works, right? Tracy, thank you so much! Yes, I suspect you have identified my trouble here—which side is the wrong side again? Which edge do I trim? This piece goes where??? I’m interested in the technique because it looks like the way to achieve minute accuracy (and also to make diamonds line up, which I can’t seem to do the traditional way) but it was truly exasperating! And I just like sewing squares from my scraps bag together by hand anyway, which is definitely restful stitching. Thank you for your sweet words, my dear. :). I don't do the "picture" kind of paper piecing but I love geometric paper piecing like Lucy Boston, etc. The lightbulb moment for me was realizing you can assemble the pieces any damn way you choose-- just try to combine them so as to eliminate or minimize sharp angles. Just reading this today.....almost New Years Day. I've been making quilts for over 40 (yikes!) years. I do a lot of machine piecing but also love hand piecing. I've TRIED paper piecing....even took a class in it. It's BACKWARDS, for crying out loud! I cannot do it. And I hate it. It's so much easier to just sew the pieces together. The accuracy will come in time.......that's my take on it! and Happy New Year! I think with paper piecing you cannot sew 4,5 & 6 together first and then to the main piece. At our retreat, the teacher said each piece is sewn on individually Then trimmed up and on to the next. I, too, got so confused with the right and wrong side for stitching and finally placed a small pin on the right side. It was still confusing but after two small projects I can see where it will become easier. Good luck with it! BTW, your knitting is perfection!! !